Trending at $90.99eBay determines this price through a machine learned model of the product's sale prices within the last 90 days. M9244LL A1040. APPLE IPOD CLASSIC 3RD GENERATION - 20GB - WHITE. We will do our best to make it right! Used, 100% tested and fully functional. Physical Condition: 8/10. Fully Functional with a NEW Battery installed. iPod pictured is the one for sale. Shows signs of use, scratches, nicks etc. Played the iPod for hours with no issues, however it is not uncommon when I test one with music already on it (when I receive it).that it will skip a song here or there, so this may happen.Looks like a lot of Classic Rock music and other Genres as well.see pictures of artists for an idea of whats on the iPod.Displays over 7000 songs, will contain duplicates. My 4th gen iPod 4th gen. Everything works fine. All the usual surface scratches. I suspect a lot would buff out. Everything works as it should and it sounds great. IPod Photo 40GB in excellent condition, 100% functional. 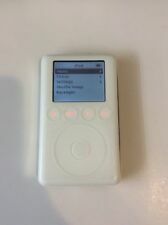 APPLE IPOD CLASSIC 3RD GENERATION 40GB - WHITE This iPod has been reset to factory settings. A FireWire cable and charger (not included) is required to charge and sync this iPod Physical Condition: 8/10 Some scratches What You Will Get: iPod ONLY Item is sold as is. No returns. THIS IPOD IS FULLY FUNCTIONAL AND HAS NO ISSUES AS THE ONLY ISSUE IS THE SCRATCHES ON THE BACK OF THE DEVICE. 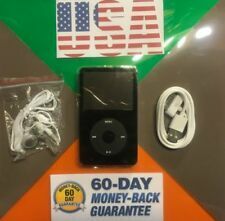 5 out of 5 stars - Apple iPod Classic 7th Gen Black, 160GB A1238 57 SONGS!!!!!!! 8 product ratings8 product ratings - Apple iPod Classic 7th Gen Black, 160GB A1238 57 SONGS!!!!!!! APPLE IPOD CLASSIC 3RD GENERATION. This iPod may NOT have been reset to factory settings and may still contain information from the previous owner. 40GB - WHITE. We will do our best to make it right! Apple iPod Video Classic 5th Generation Black 60GB - New Battery + Wolfson DAC! IPod has passed a high-standard comprehensive test which covers all aspects of the iPod's functionality. iPod is in great condition as seen in the pictures! New battery installed and works great! 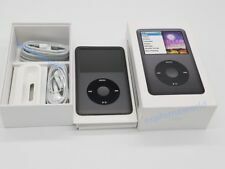 Apple iPod Classic 5th Generation 30GB Video. This model has the preferred Wolfson DAC. All functions work as designed. This iPod is in good shape with scratches and scuffs from normal use. The back has still has a good shine to it. Apple iPod classic 2nd Generation White (10 GB). Condition is Used. Shipped with USPS First Class Package. I don’t have a charger for it. IPod is in good condition overall. 30gb storage. iPod has typical scratches around body from normal lite use. iPod only, no cable. APPLE IPOD CLASSIC 3RD GENERATION - 15GB - WHITE. We will do our best to make it right! Used, 100% tested and fully functional. Physical Condition: 8/10. Our warranty covers manufacturer defect ONLY. Apple iPod photo classic 4th Generation Harry Potter Special Edition White (20 …. Condition is Used. Shipped with USPS First Class Package. A few scratches on the back but other than that it works great. IPod 3rd Generation Classic 15GB, fully functional with a NEW Battery installed. The iPod pictured is the actual iPod you will receive. Shows signs of use, scratches etc. 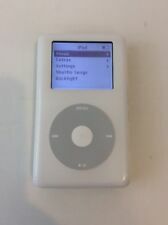 Apple iPod classic 3rd Generation White (15 GB). Condition is Used. Shipped with USPS First Class Package. APPLE IPOD CLASSIC 5TH GENERATION - 30GB - WHITE. We will do our best to make it right! 100% tested, fully functional. Back: Heavy scratches. Front: Heavy scratches. Apple iPod classic 5th Generation U2 Special Edition Black/Red (30 GB). Condition is Used with some scratches, but item works flawlessly. 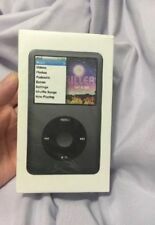 Apple iPod classic 5th Generation Black (120 GB). Condition is Used. Shipped with USPS First Class Package. iPod is in great shape. All original, not refurbished, was well maintained. Reset to factory settings. Ready for use. No box. original headphones and original adaptor included. Protective case with belt clip on it included (pictured). It is pre-loaded with more than 5000 songs and more than 500 Podcasts. It Plays songs. I do not know anything about ipods and therefore listed it as "USED CONDITION AND SOLD AS IS". I may add the Charging Cord as well. Working well iPod classic 5th gen 30gb. Apple iPod classic 5th Generation U2 Special Edition Black/Red (30 GB). Condition is like new and has been factory reset. Comes in factory box with all included material and original headphones and charge/sync cable. I've looked closely and can't find one scratch on this iPod, the black does show finger prints and that is what you see in the pictures. Apple iPod classic 5th Gen White (60 GB) A1136 Good Condition, Works Perfectly. Condition is Used with scuffs Shipped with USPS First Class Package. APPLE IPOD CLASSIC 2ND GENERATION - 10GB - WHITE. Front: Heavy scratches, nicks, yellow stains. Used, 100% tested, fully functional. Physical Condition: 7.5/10. We will do our best to make it right! Trending at $59.97eBay determines this price through a machine learned model of the product's sale prices within the last 90 days. Used, 100% tested, fully functional. We will do our best to make it right! Front: Heavy scratches, nicks. APPLE IPOD CLASSIC 3RD GENERATION - 10GB - WHITE. We will do our best to make it right! Used, 100% tested, fully functional. Physical Condition: 8/10. 4 out of 5 stars - 40GB Classic Apple iPod Photo 4th Generation (A1099)+ New Battery & Wolfson DAC! 53 product ratings53 product ratings - 40GB Classic Apple iPod Photo 4th Generation (A1099)+ New Battery & Wolfson DAC! Condition is Used. No cords or accessories. Tested and is working. This warranty is provided by us and will cover any operational failure.